GAC Festive Opening Hours 2015! GAC's 12 Deals of Christmas 2015! The countdown is on and it's day one of 5 to our biggest ever winter sale!! 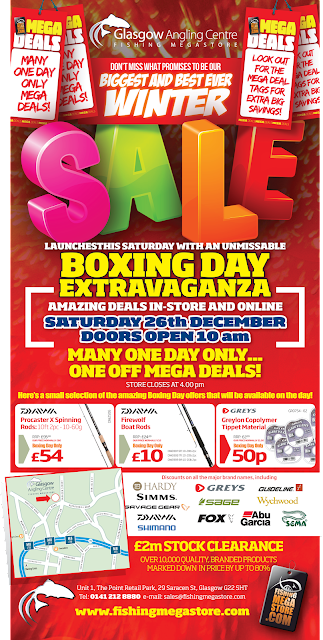 This Saturday, 26th December sees Fishingmegastore's Boxing Day Extravaganza, with amazing deals instore and online. It's a massive £2m stock clearance where we slash prices on over 10,000 quality branded products with up to 80% off! We've got massive savings on Hardy, Greys, Guideline, Daiwa Simms and Sage to name but a few, so you are guaranteed to pick up a bargain and save loads of cash. To whet your appetite, we are doing the Daiwa Procaster X Spinning Rod for only £54.00, Daiwa Firewolf Boat Rods for only a tenner and Greys Greylon Tippet Material for only 50p! This is just a small sample but you can be the first to see some of our other Fishingmegastore Boxing Day Deals. There will be a host of other deals that will be available for one day only but we've got some deals hidden up our sleave that we know you're just going to love!! Doors close at 4.00pm so get in there early, grab a bargain and beat the rush!